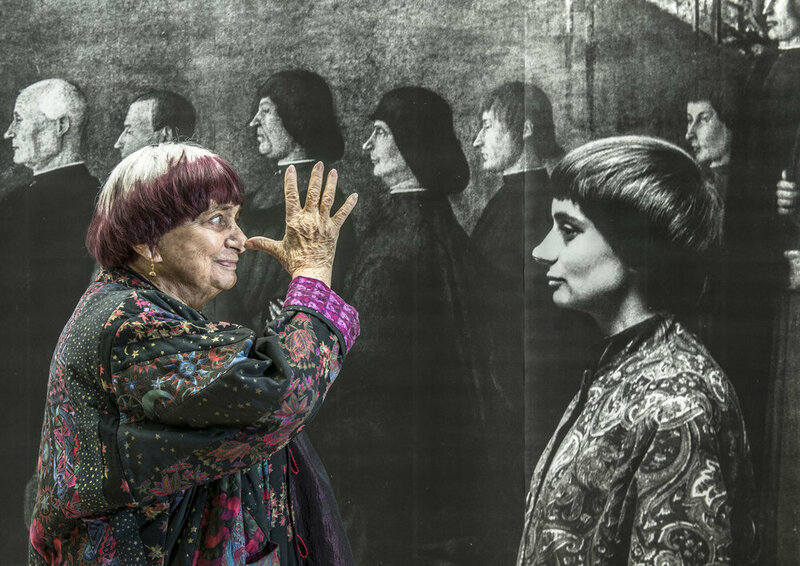 Agnès Varda, old and new. Agnès Varda has many monikers. She’s known as the Godmother of French New Wave, the psychedelic mushroom of documentary and the cat lover of auteurism. I may have made up the last two, but her instantly recognisable hairstyle, feminist perspective and signature appearance of cats in her films makes her one of the greatest living filmmakers today. If Varda is a name you recognise, then rightly so. She paved the way for women in cinema and introduced the world to a often unseen female gaze. Varda has been smashing glass ceilings for almost seven decades, with unbelievably iconic pieces of cinema that have explored everything from migration and war, to class and women’s stories. Varda has a plethora of film under her name, and it can be difficult to decide where to begin if you’re interested in getting to know her. My favourite is probably Cléo de 5 à 7 (1962), a genius 90 minute feature that follows the titular singer Cleo around Paris as she waits to hear back from her doctor about a potential cancer diagnosis. Varda expertly creates a character that refuses to be constructed by the gaze of others. She defies expectations and wanders the city aimlessly, giving us a perspective that comes across as both unique and oddly alluring. It explores themes of existentialism (as the French notoriously do so well) and remains political in it’s approach and commentary to the Algerian war - a revolutionary decolonisation that France still struggle to admit ever took place. Agnès Varda is an exciting filmmaker that, in her 90th year, is as relevant as ever. 2017’s Faces Places is a documentary that follows Varda and photographer JR as they travel around France in search of forgotten communities. From coal-miners and dock workers, to waitresses and farmers, Varda and her unlikely companion take photographs of small-town faces and print them out to be larger than life. These images are then plastered across their homes, town centres and workplaces. The film acts as a reminder of those who are integral and often forgotten, while touching on Varda’s own symptoms of ageing, in an expertly executed road-movie that brings forth a side of France oft-unseen, and rarely romanticised so delicately. Varda will be making her figurative Screen25 debut this month as we screen Faces Places, which she co-directed and stars in, alongside JR. And to make it even more special, it seems that we have accidentally and genuinely unintentionally programmed it on my birthday, a serendipitous gift if ever there was one. Faces Places screens at our Odyssey Film Club on Wednesday 28 November. Book now.